Shake your dates! It’s officially summertime. Here in Seattle, the days are long and gorgeous. Everything is green green green, except when the sky turns pink for an almost-10-pm sunset. People jog around Greenlake in short shorts, shoes crunching the gravel as they mosey or fly. Groups of friends set up volleyball nets in the park, or spread blankets on the grass for a lazy midday picnic. They splash in the lake with their little ones, or kick soccer balls or ride bikes. One group practices some kind of “freestyle frisbee” situation, kicking and flipping and ducking and swooping, almost like they’re playing hacky-sack (remember that? ), except with a frisbee instead of a little beanbag. It’s probably really hard to do but it makes me laugh a lot to watch them. Summertime rituals! Easily dusted off and brought back to life. My favorite rituals of the season are long walks outside, ice cream from a cone, sunblock that smells like coconuts, long cotton dresses, peach picking, new leather sandals, and, of course, popsicles. Also freestyle frisbee. Popsicles! Of all kinds. I like the red, white and blue rocket pops. I love fudgesicles. I really want to try these smoked peaches and cream pops. 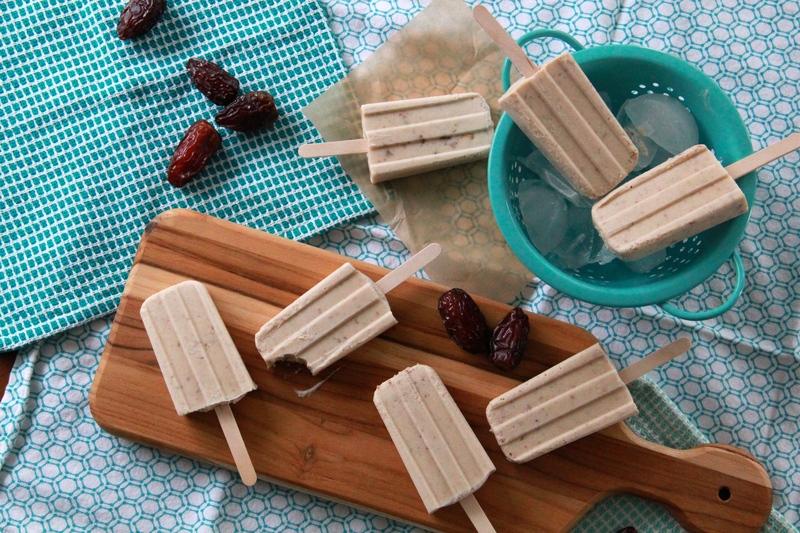 And date shake pops! These ones happen to be the richest, creamiest pops I’ve ever made. They’re inspired by the date shake — have you heard of this phenomenon? Date shakes are basically just milkshakes made with fresh dates and vanilla ice cream. Instead of going the ice cream route for these pops, I used coconut cream and a whole vanilla bean. Holy sweet Mariah Carey. They are good. 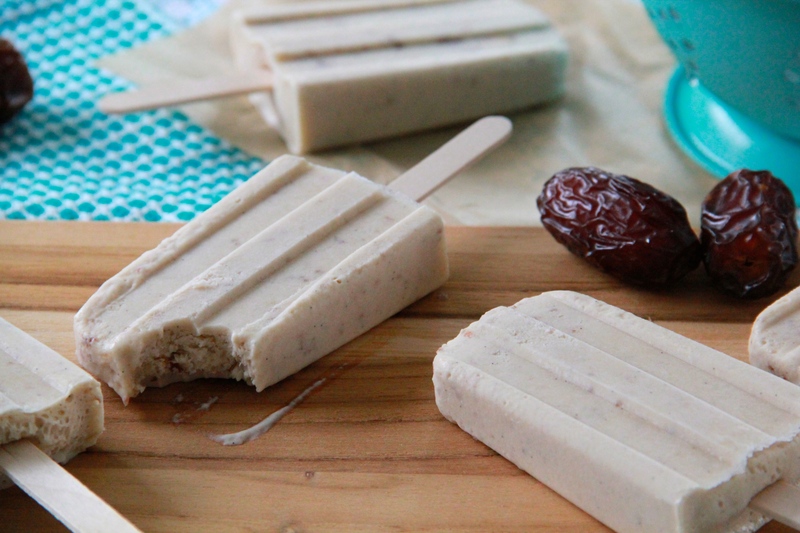 The dates bring an almost caramel-y flavor to the pop, and and the coconut cream’s lush, rich texture makes you feel like you’re eating the creamiest of ice creams. And since they’re both sweet on their own, no added sugar needed! Just some vanilla bean seeds for that floral aroma and the visual pop of black on white. Three ingredients. Boom. Popsicles. Do you have a popsicle mold? They’re inexpensive and kind of the most fun (I own this one). Don’t be like me and look for popsicle sticks at your local hardware store, though. They won’t have them and you’ll go to two other places and waste nearly an hour before you realize you could just buy a pack of 100 from Amazon in about three minutes flat. Let’s make popsicles. It’s #POPSICLEWEEK! You can find cans of coconut cream at Trader Joe’s, otherwise you can put cans of coconut milk in the fridge, to help the milk separate into coconut water and coconut cream (then just scoop out the cream for the popsicles and save the coconut water for another use). If you don’t have whole vanilla beans, you can substitute 2 teaspoons of vanilla extract. Melt the coconut cream in a small saucepan set over medium heat. Add the dates and scraped vanilla bean and cook, stirring occasionally, until the mixture starts to steam. Remove the pan from the heat, take out the vanilla bean pod (rinse it and save it for another use!) and dump the coconut date mixture into the bowl of a high speed blender or food processor. Pulse the mixture until it’s well-blended but there are a few date chunks throughout. Carefully pour the mixture into popsicle molds (I got seven 3-ounce pops) and freeze for an hour before inserting popsicle sticks and continuing to freeze until firm. Run the mold under a bit of hot water to loosen the pops for serving. Previous Post: « POPSICLE WEEK! A 10 p.m. sunset?? Whoa. 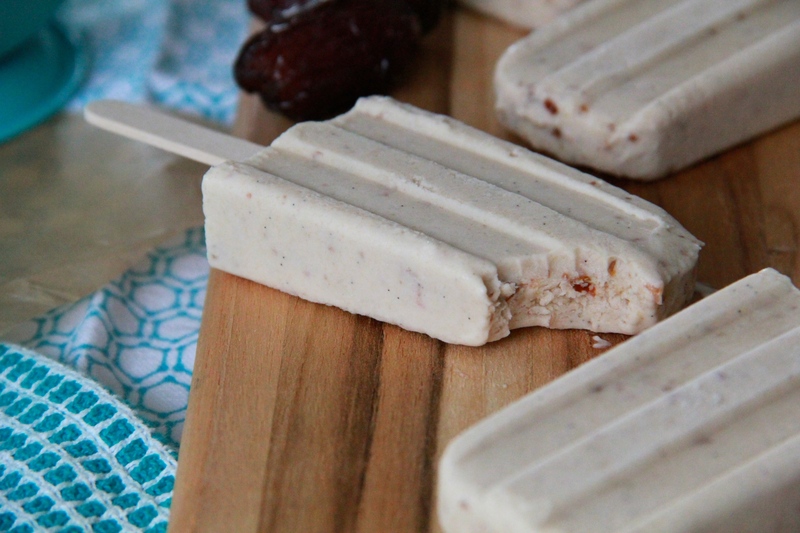 I could eat a lot of date shake pops by then. Can’t wait to try this recipe! Love love love this flavor combo. I think I need a date (sorry) with these guys. They sound just gorgeous. I freaking LOVE date shakes! And a date shake pop? That’s awesome! Like a date shake, but it lasts longer. Lurrr dat. zomg. I love everything about these so, so much! 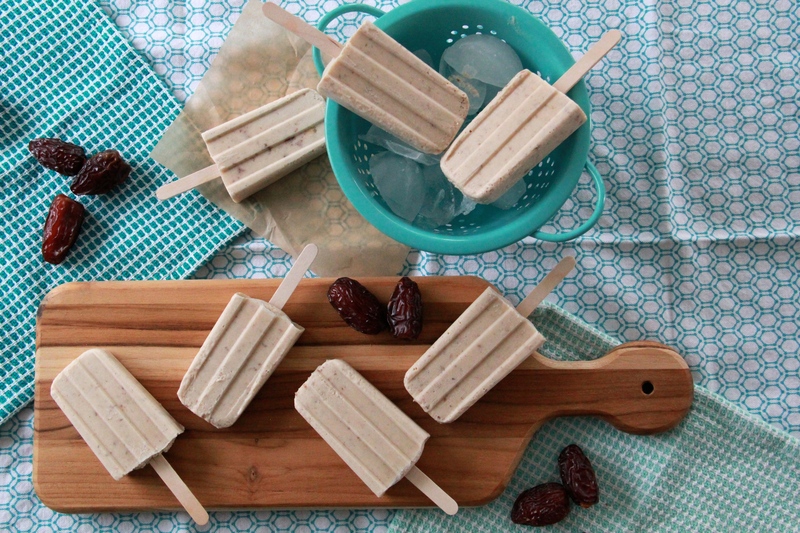 date shakes are definitely a thing and date shake pops are the obvs the newer, hotter (hmm, frozen, so not hot!?) thing in town. i could see myself indulging in one too many of these! I ended up remembering I had popsicle sticks in my caramel apple kits I bought last year! Tossed the caramel and used the sticks! But my oh my I love a date shake. Just such a dreamy flavor! Love that you picked that!! I feel like I’m missing out – I really need to get with the date program. These are beautiful and sound delicious! !